We’re back for week 2 of over/under picks. If you missed week 1, it’s not too late to get in on the action. Indiana’s offensive debut had some problems, but one encouraging sign was the intent to get the ball into the hands of Indiana’s playmakers. On the first play of Indiana’s second drive, Whop Philyor rushed for 9 yards. Two plays later, Reece Taylor broke a tackle on a 32 yard rush. Philyor added a 14 yard rush later in the second quarter and Taylor added 2 rushes for 8 total yards in the second half. The explosiveness from this pair is a big boost to an offense that is potentially thin at running back. It will be important to continue to get the ball in their hands. 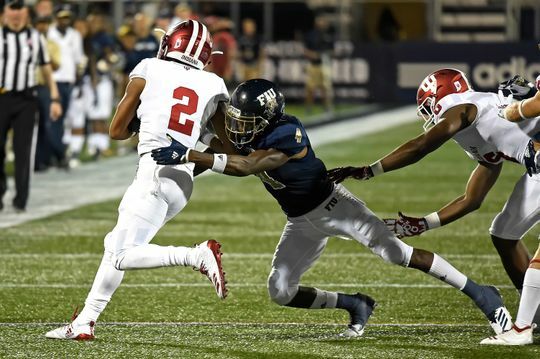 Against FIU, Indiana running backs had 30 carries. Just 1 went for 10+ yards, a paltry explosive rate of just 3.3%. That was even worse than the 7.7% averaged by backs last year and the 10% career average from the 2017 running back position. With Cole Gest out for the year, Mike Majette or Ronnie Walker are probably the most likely candidates to break a long run, but it is unclear how involved they will be. Majette was sprinkled in throughout the FIU game but it doesn’t appear that he’ll receive more than 10 carries a game. While Walker is the most heralded of the backs coming out of high school, he has yet to appear in a game. Stevie Scott’s longest rush was just 9 yards. Virginia allowed just 1 rush of 10+ yards, but it was only on 8 running back carries. Bryce Perkins, making his Virginia debut as a Juco transfer, rushed 10 times for 120 yards once sacks are factored out. He had 4 rushes of 10+ yards, including a long of 36. With a defense that is still a little inexperienced and a linebacker position that Tom Allen voiced his displeasure with following the FIU game, it will be important to contain Perkins, particularly if the potential rainfall stays in the forecast. The Cavaliers allowed a 10% sack rate to Richmond, giving up 3 sacks on 29 pass attempts plus sacks allowed. Last year Virginia ranked 59th in adjusted sack rate allowed although that was with the less-mobile Kurt Benkert. However, often more mobile quarterbacks have higher sack rates because they try to do more with their legs than just throwing the ball away. We’ll see if the Hoosiers can get pressure on Perkins. Indiana had a sack rate of 10% last year in non-garbage time, but that was with Tegray Scales, Robert McCray, and Greg Gooch. Indiana had just 1 sack against FIU. The Hoosiers had some long drives against Florida International including two with 12 plays and two with 11. Last year Indiana had nearly 13% of their drives lasting 10+ plays. Long drives are more an indicator of how efficient a non-explosive offense is. They generally result when an offense can stay on schedule by being efficient, but doesn’t pick up chunk plays. The Hoosiers were incredibly efficient against FIU posting a 51% success rate. In 2017, Indiana averaged a 56% success rate in non-garbage time against Georgia Southern but the next best success rate was 41%. In the 4 drives reaching 10+ plays against FIU, the Hoosiers had just a 2% explosive rate compared to a combined 11% in the 6 other drives. Virginia allowed just a 29% success rate to Richmond, although they will face a tougher test this weekend. If Indiana struggles to generate big plays, it may be harder to sustain drives long enough to reach the end zone this Saturday. Vegas has this one at 6.5. Bill Connelly at Football Study Hall hasn’t published his week 2 predictions but I *think* he’s going to have Virginia favored by about 1.9 points but I have been an idiot before. If you are picking the over, you are picking Indiana to win by 7+ points. If you are picking the under, you are picking Indiana to lose or win by 7 points or fewer.